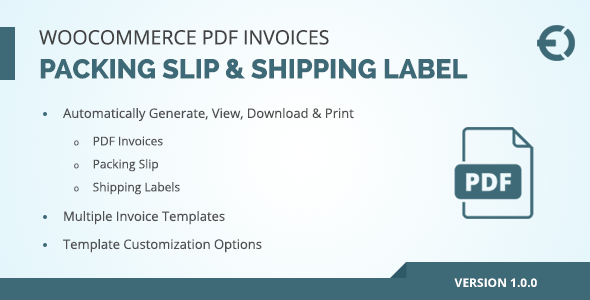 WooCommerce PDF Invoices plugin automates the creation of PDF invoices, Packing Slip & Shipping labels. Save your staff time by skipping tasks of copying order details to an invoice format and sending it manually to the client. You can select any template from 6 available templates for invoicing. Personalize the templates, add business name, address and logo. With WooCommerce PDF Invoices plugin, you can automate PDF invoicing of your eCommerce website. The admins can view, edit & dowload PDF Invoices from the order page. Whereas, the customers can view & download PDF from “My Account”. The WooCommerce PDF Invoicing plugin offers numerous options to display all your business relevant details on the sales receipts. You can add business name, logo, watermark, email, address, and phone and fax numbers. You can also add legal information such as Business ID or company VAT to become creditworthy in the eyes of your customers. Select from 6 different invoice templates that best matches your requirements. You can further customize the invoice by a preferred color and font. 6 different invoice templates are available with the variety of color, design, font, and layout. Choose the one as per your preference. Select a color for the template as well as the font if are not satisfied with the default setting of an invoice template. You can also change font sizes. PDF Invoices plugin also assist you in instantly generating packing slips and shipping labels that have to be accompanied with the consignment while dispatching to the customers. Create print-ready shipping labels for your consignments at a single click rather than composing them from the scratch. It contains addresses of the sender (your business) and receiver (your customers). WooCommerce PDF Invoices is a complete package for automating the creation of PDF invoices with company branding. In addition to the basic configuration, you can avail these options to further personalize sales receipts.